Iceland Bingo is a top online bingo brand that offers an incredible variety of gaming options, promotions and an amazing bingo community. If players are looking for a perfect combination of free bingo games, mega jackpots and loads of instant games, Iceland Bingo is the place to play. To begin with, when players join they get to claim a nice 300% welcome bonus on either slots or bingo. 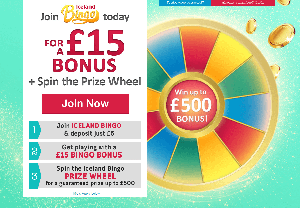 Once you're a full member you'll receive instant access to Iceland Bingo's amazing selection of promotions. Some of the top promotions currently available include £100 Happy Hour with 10p tickets every night at 10pm, the Exclusive Pennies Make £'s promo with 1p tickets and £30 jackpots and Daily Voucher Hour with £5 Iceland Voucher's up for grabs every night! 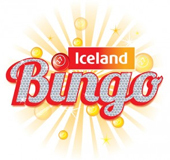 There are plenty of other fabulous promotions at Iceland Bingo that are too numerous to list. However, one of Lord Bingo's absolute favourite is £1,000 Free Bingo that runs every week on Tuesdays and Saturday for Ice Gems Club members. Players can ascend the ranks of Iceland Bingo's Loyalty Club and get rewarded in the process. From the moment you become a member at Iceland, you begin accumulating special loyalty points depending on how much you deposit and play. The ranks range from Onyx (£0), Emerald (£5-£500) and Sapphire (£500 Plus) to the exclusive invite only Ruby and Diamond levels. Rewards range from free bingo to increased monthly cashback, free game tickets and more. Iceland Bingo is a part of the Cassava network and runs on Dragonfish software. They have loads of different bingo options including 90-ball, 75-ball and special High 5 Bingo. Players can enjoy plenty of coverall jackpots, progressive jackpots and different featured games. Some of the best featured games hosted on Bingo Iceland include Starburst, Jack and the Beanstalk, Gonzo's Quest, Fruit Shop and the ever-popular Fluffy Favourites.